Affluent K/​B parents seek academically & professionally qualified son from very respectable with a similar background for their well accomplished pretty Doctor daughter born 1984. Inherits considerable assets. Respond with family details & horoscope. f​l​o​w​e​r​1​1​v​i​e​w​@​g​m​a​i​l​.​c​o​m​ Tel: 0115030103. B/​G parents from Colombo seek educated,​ suitable partner for their fair,​ pretty January 1991,​ 5’ elder daughter MSc IT Engineer presently employed as an IT Engineer in a foreign country residing with the family. Please respond with family details horoscope. Contact number p​j​a​y​9​1​l​k​@​g​m​a​i​l​.​c​o​m​ 011-2700026. 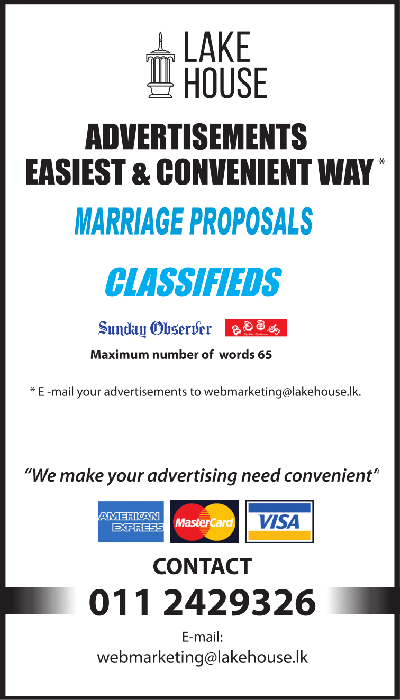 B/​G respectable family Colombo suburbs seeks well mannered educated professionally qualified son for their daughter born 1990/​Oct. 5’4” fair graduated BSc. in Australia and working as Software Engineer in Sri Lanka,​ she inherits upstair houses,​ vehicle and other assets. Please respond with family details with horoscope to p​r​o​p​o​s​a​l​p​r​v​1​9​9​0​@​g​m​a​i​l​.​c​o​m​ or 0112774763. Colombo suburbs Sinhala Buddhist parents seek partner for their pretty daughter 5’5” born in May 1990. She obtained B.Sc. (Hons) and MBA,​ working as a Software Quality Assurance Lead in a reputed IT Company. Willing to migrate. Caste immaterial. Not a malefic horoscope. Please reply with horoscope,​ family details. Email: r​u​r​a​a​b​1​2​3​@​g​m​a​i​l​.​c​o​m​ Contact after 4.00 p.m. - 0112937099. Kelaniya,​ Sinhala Buddhist parents seek partner for their pretty daughter 5’4” born in November 1991,​ B.Sc (Hons) graduate doing an executive level job. Caste immaterial. Mostly preferred Western Province proposals. T.P. 0112937099. Kottawa Govi Buddhist mother seeks a suitable partner for her unmarried pretty young looking educated (MBM) daughter 46 5’-3 1/2” assistant director finance from a leading firm. Reply in Sinhala/English with horoscope (malefic) and family details. Muslim parents from Colombo are in search of an educated,​ religious and kind hearted groom for their daughter. She is an English medium educated graduate who is grounded in religious values and has a pleasing personality. She had an unfortunate marriage which ended in divorce (innocent party). She has no encumbrances. The groom should ideally be in his mid thirties with compatible values and a good character. If interested,​ kindly email details relating to the groom to : m​u​s​l​i​m​p​a​r​e​n​t​s​9​8​0​@​y​a​h​o​o​.​c​o​m​ All communications will be treated in strict confidence. Roman Catholic Sinhalese parents from Wattala seek suitable educated religious partner for their daughter 26 years 05 feet,​ medium complexion and academically qualified with university degree. She owns substantial assets including house & commercial property (land). Please email (r​i​e​n​z​i​e​f​b​t​c​@​g​m​a​i​l​.​c​o​m​) full details with contact No. 1988 Born Govi Buddhist daughter of reputed businessman educated at Sirimavo Bandaranaike Colombo,​ obtained Degree from Monash University Australia height 5’5”,​ seeks businessman or educated partner. s​w​a​r​n​a​p​a​l​a​6​1​@​g​m​a​i​l​.​c​o​m​ 0114884261.